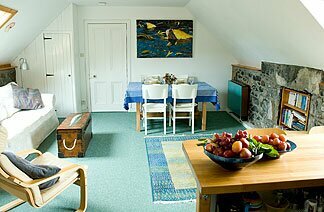 Our self catering apartment occupies most of the top floor of Frachadil House. The open plan fully equipped kitchen and living room is light and spacious. The kitchen has a full sized electric double oven with ceramic hob, a microwave, and fridge. 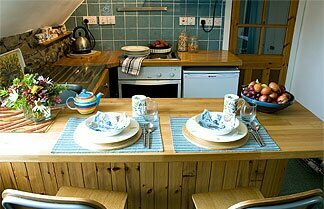 Tea towels, washing up liquid, bin bags and hand soap are provided, and a complementary tea tray greets you on arrival. In the living room there is a TV, DVD player, ipod docking station and radio. In the bookshelves you will find a large selection of DVDs,and books of local interest. 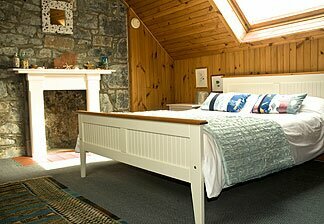 The bedrooms are also roomy and light, the first having a king size bed and the second a double and a single bed. All windows have stunning open views. The bathroom has a bath and separate shower,wash basin and toilet. As you enter the house there is a large porch for coats and boots and anything else you don't need upstairs. We have plenty of shed space for bikes, surf boards, push chairs etc and ample parking space close to the house. The apartment is completely independent from the rest of the house, but its often handy to have someone close bye for local advice and recommendations. 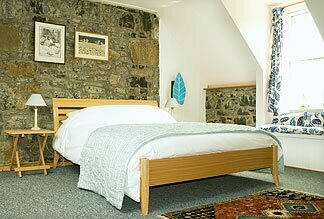 You will find the atmosphere very relaxed and comfortable and we hope your stay will be an enjoyable escape into the slower pace of life here on the beautiful Isle of Mull.